This breakfast/dessert/snack whatever you want to to eat it for is almost too good to be true. This Coconut Oatmeal Cookie Smoothie Bowl is made with less than 7 ingredients and ready in under 10 minutes. 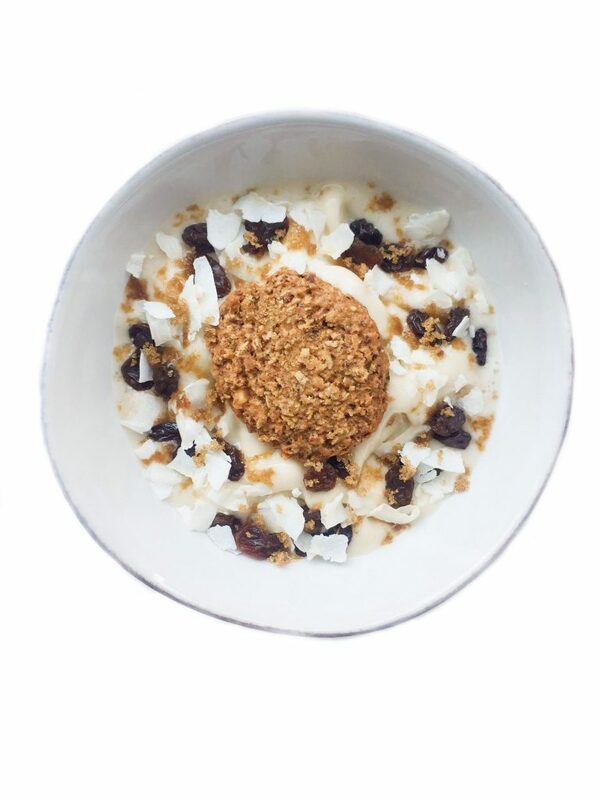 Plus it tastes like oatmeal cookie ice cream (um, yes please) and it is filled with good-for-you ingredients that won’t make you feel sluggish. It is so important to me to fuel my body with ingredients that are good for me, and still taste amazing. I really struggle trying to drink straight up green juice or kale smoothies because they don’t taste good to me. Even though they are super healthy and give us extra boost of nutrients, I have a hard time taking more than 1 sip. There needs to be a happy medium with food that tastes good yet is still good-for-you. That is my mission here on my blog. I hope to inspire you all to eat food that tastes amazing AND makes you feel amazing and not guilty for eating. ginnybakes has a similar mind set. They want us to indulge mindfully. It is important to treat our bodies with the respect it deserves. If we crave cookies, eat some. Just make sure they are made with ingredients you trust and what will make you not feel guilty after. We need to indulge to make us appreciate food and help us keep a healthy perspective. My Coconut Oatmeal Cookie Smoothie Bowl does just that. By now you know my love for ginnybakes from my Double Chocolate Peanut Butter Swirl Brownies, Chocolate Chip Cookie Smoothie Bowl, Gluten Free Peanut Butter Cup Blossoms and more. I can’t help myself, their products are that delicious! 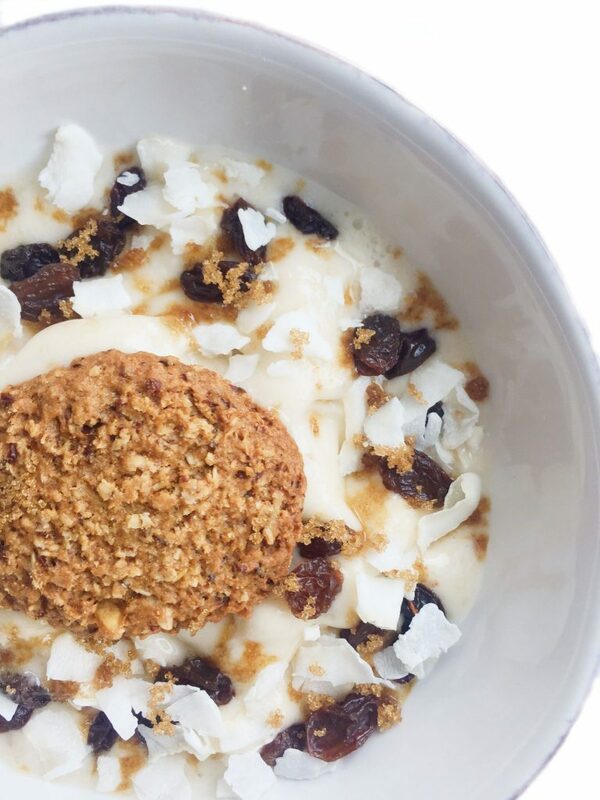 Instead of using your traditional oatmeal raisin or chocolate chip cookie in this smoothie bowl, I used ginny bakes coconut oatmeal cookies. I used my usual smoothie bowl base ingredients (aka bananas, nut milk, etc.) 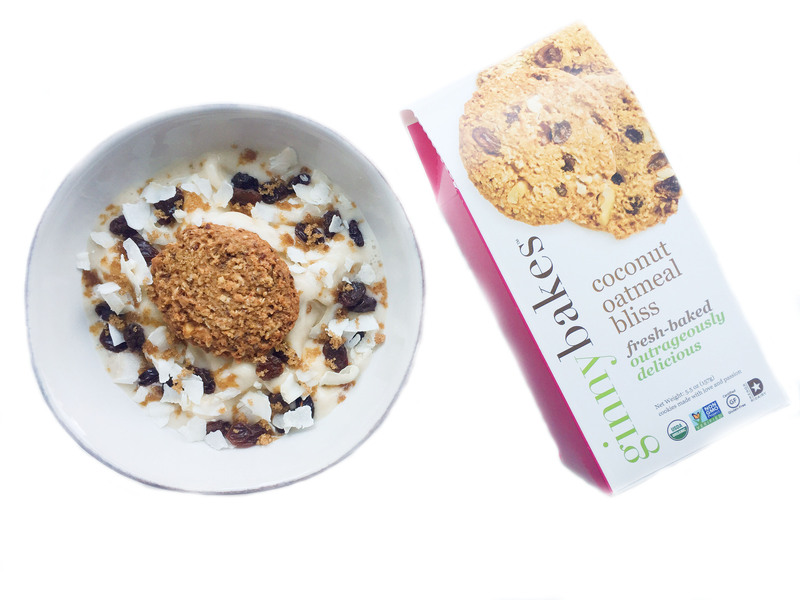 and topped it with raisins, unsweetened coconut flakes, brown sugar and the ginnybakes coconut oatmeal cookies on top. Basically I had a bowl a straight up heaven! Cookies for breakfast?? I’m in. You always have the best bowls?? It’s like you read my mind and sense my cravings! I have a bag of shaved coconut at home and can’t wait to make this! Oh hello, GORGEOUS! I literally love everything about this right here. I really must get my hands on some ginnybakes mixes!